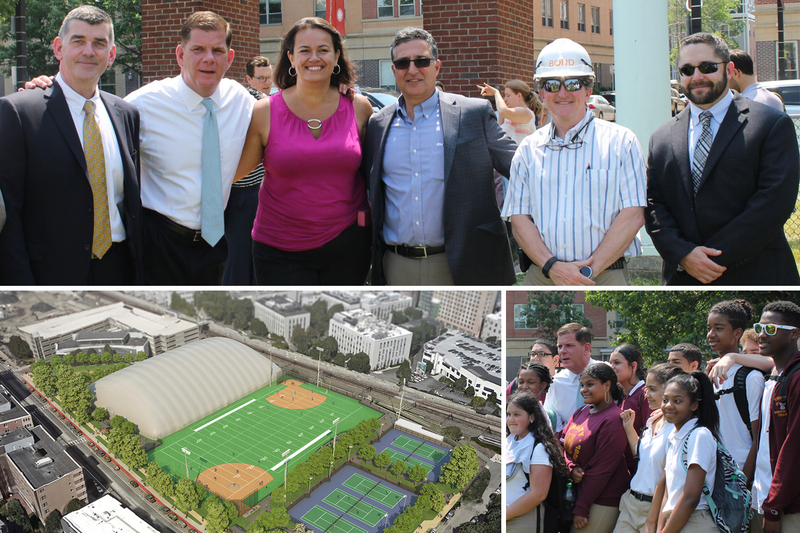 (Boston, MA) – BOND, the Northeast’s premier building, civil, utility and energy construction firm, recently joined officials from Northeastern University and the City of Boston to celebrate the groundbreaking of the new William E. Carter Playground on Columbus Avenue. The project is the result of a unique public-private partnership that involves developing a state-of-the-art athletic complex and expanded recreation opportunities for city residents and Northeastern students. Alongside Boston Mayor Martin J. Walsh and Northeastern University President Joseph E. Aoun, BOND executives and project leaders joined in the festivities marking the beginning of this collaborative project. BOND is providing preconstruction and construction management services for the Carter Playground project, which is a 6.7 acre site that includes: two multi-purpose turf fields, five tennis courts, inclusive playground and splash pad, passive corner park and streetscape improvements. Additional enhancements include improved infrastructure, such as irrigation and drainage, as well as field lighting and scoreboards. The University will place a temporary air structure—or “bubble”—over one of the playing fields during the winter months to extend the availability of the facility for both students and city residents. Project construction is currently underway and slated for completion by end of year 2018. Once completed, the transformed public park will be one of the largest city park/playgrounds in the South End and Roxbury.